Elizabeth Adu, a Ghanaian lawyer, retired from the World Bank in 2013. Most of her career was in the Legal Department, where she became Deputy General Counsel, Operations. Thereafter she was Senior Advisor to the the Managing Director overseeing reforms to the World Bank’s internal justice system, with particular focus on the reforms to the peer review process and the Administrative Tribunal. She was then appointed Director for Operations Services for the Latin America and Caribbean Region of the World Bank. In that role she oversaw the quality of the World Bank’s portfolio as well as the procurement and financial management aspects. 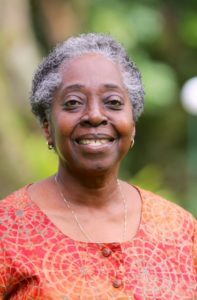 Since 2013, she has been an advisor to the PTF and a member of the Board of Trustees of the Center for International Forestry Research (CIFOR).